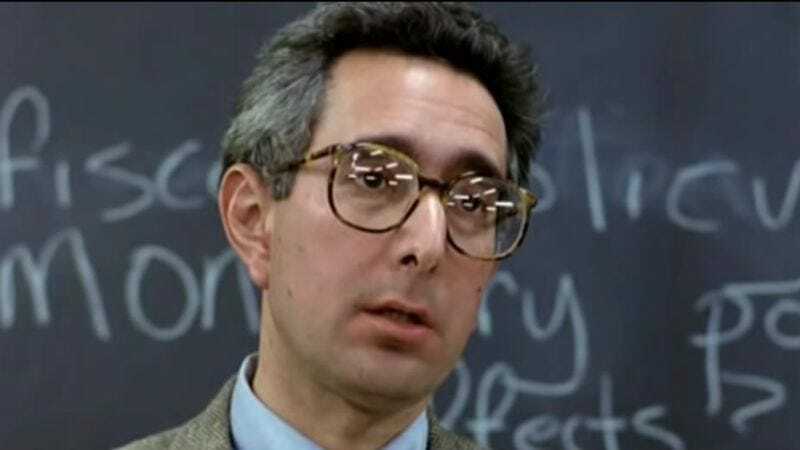 In John Hughes’ Ferris Bueller’s Day Off, supernaturally dull economics teacher Ben Stein bored his teenage students into a state of catatonia with his endless, droning lecture about the Hawley-Smoot Tariff Act Of 1930. Now, Stein is ready to provide the same service for the users of a subscription-based meditation app called Calm, only this time he’s actively trying to put people to sleep. This week, after months of beta-testing, Calm is launching a new feature called “Sleep Stories.” Described as “bedtime stories for adults,” these are pleasant but deliberately uninteresting texts (think: essays by Scottish-American naturalist John Muir) read aloud in calming, soothing voices. It’s intended to put grown-ups to sleep, the way Goodnight Moon supposedly does for small children. And now, Calm has broken out the heavy weaponry in its war against wakefulness: Stein himself, who will read in his trademark monotone from Adam Smith’s The Wealth Of Nations, a pivotal economics volume from 1776. That book, described by Investopedia as possibly having a greater worldwide impact than the Declaration Of Independence, is now apparently the literary equivalent of chugging NyQuil. Stein’s reading of the first chapter of Smith’s book will be available to Calm users on Friday. In discussing “Sleep Stories” with Mashable, Calm co-founder and CEO Alex Tew said, “Having a soothing voice talk to you in a rhythmic, melodic fashion is very comforting.” It’s difficult to know where exactly Stein fits into that model. His voice is anything but melodic, since he famously hits the same exact note over and over again. The hope, apparently, is that people will associate Stein’s voice with sleepiness and that will be enough to lull them into unconsciousness.